I am in NEED of some nutrition. You guys, last night we feasted! I’m still full. My sister threw a New Year’s Eve dinner party for a few friends. We played games, we sipped our way thru a few bottles of champagne, and we ate. Oh boy, did we eat. Steak, lobster, scallops, shrimp. Yup, 4 different kinds of meat. Not to mention mashed potatoes, roasted vegetables, and bread on bread on bread. We rung in 2014 right. It was amazing. 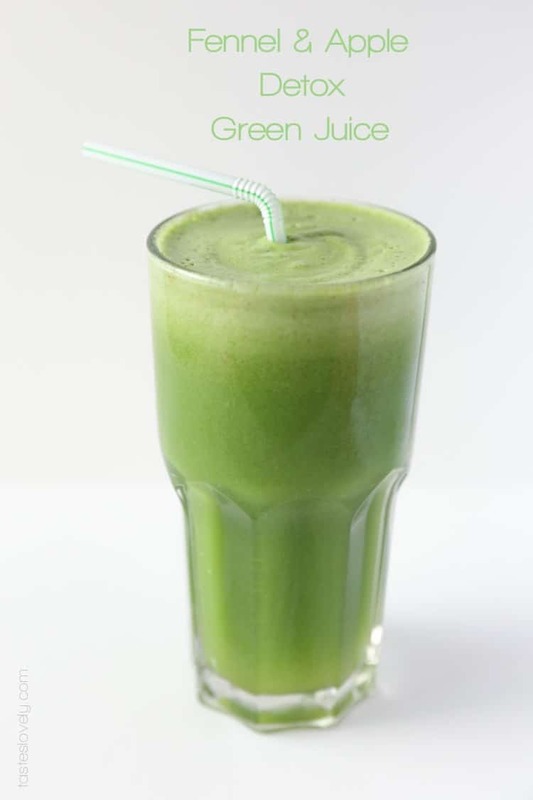 After all the eating and drinking, I love to kick start my health with this delicious rejuvenating detox green juice. With this gorgeous green color you know it’s full of nutrition. It’s full of spinach, fresh apples, fennel, cucumber, mint and lemon. It is light, crisp and delicious. After drinking it you can feel your body absorbing the nutrients. I splurged and got the Breville 800JEXL juicer this summer and I *love* it! 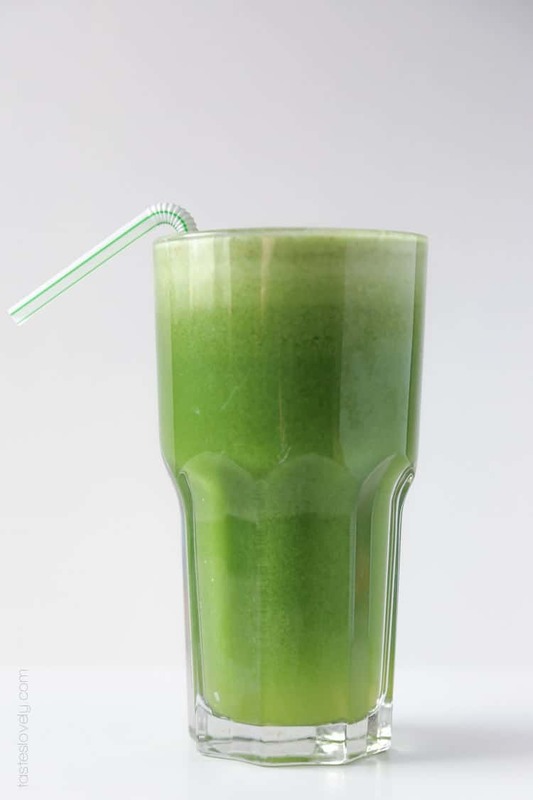 I make myself green juices all the time for breakfast, it is a great way to start your day. If you’re thinking of getting a juicer, I highly recommend it. Get’s out all the juice from the produce, juices everything quickly and is easy to clean. 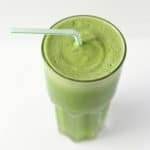 If you don’t have a juicer, you can make your green juice in a blender, which Kelly from Just a Taste does a great job explaining and includes an easy to follow video. I hope you all had safe and fun New Year’s Eve, and that this detox green juice helps you keep your New Year’s resolution for health and well being. 1. In your juicer, add in the ingredients in the order listed above. 2. For best results, drink immediately at room temperature, or served over ice. 3. Will keep in an air tight container for 3 days. Preach on the eating last night! I am still so full…which I guess is a good thing since eating better starts today. This drink is gorgeous. Thanks! I’m still full too, almost 24 hours later. Barely had to eat today. Happy New Year Leah! Thanks! I’m excited to start eating better too, New Year always means the end of indulgent food. Phew! Don’t know how many more cookies and mashed potatoes I could eat. Happy New Year Cailee! Oh yes, I think I’m in need of some of this juice as well. Last night was crazy! What a gorgeous color, by the way! I think it’d make me sad to drink it haha. Thanks Consuelo! Juice definitely helped me today. Might have had a wee bit too much champagne last night : ) Happy New Year to you too! Then this will work great for you! I’ve done a ton of juice cleanses now that I have a juicer. The longest I lasted was 6 days. Hope yours goes well! Natalie this is so perfect right now! I think we all can use this!! ;) I love that beautiful green color! Thanks Layla! If you were my neighbor I’d make you a nice big glass of this for breakfast. The green color is so pretty. Smells great too as you’re juicing. Ohhhh, I love fennel but have never tried it in a smoothie. I bet it’s good combined with apples. Honestly, now I feel like having some apple fennel stuffed pork chops. Hahahahaha. :) So nice to hear you have a fantastic New Year’s Eve celebration. Thanks Kathy! The fennel gives a great, subtle licorice flavor. It was a nice change up in juicing flavors when I did a 6 day juice cleanse in the fall. I was going to do a week, but only made it to 6 days. Ha! And now I want apple fennel stuffed pork chops too! Yum! Lucky for me, diet starts Monday, *wink*. SalinaThank you my friend. As I write this, just two days later, th&r2e#8e17;s no snow to be seen and the sun is shining beautifully. It was quite beautiful though and I’m glad I took the time to get my camera out to play for a little while. Blessings to you. Yum! I totally need this. WAY too many cookies and rich food over the holidays! Thanks Kelly! You and me both. I actually had a cookie today with lunch, whoops! Need to start eating better ASAP. Shiver me timbers, them’s some great inotimaorfn. I could totally use this after all the unhealthy food I’ve been consuming during the holidays. I love the idea of apple, fennel and cucumber. This drink is so appealing to my eyes. Love the green color. Pinned. :) Happy New Year my friend and I look forward to reading more of your delicious posts. Thanks Anne! You feel amazing after drinking this. Like you are a healthy little bee bursting with energy. I love the green color too. So pretty. Happy New Year to you too lady! Replacing the sugar running through my veins with nutrition via fennel apple juice sounds wonderful! 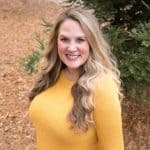 Out with the holidays, in with health! Gorgeous juice, lady! Thanks Julia! I love the green color. And luckily it is still naturally sweet enough to ease you off all the sugary sweets you’ve been eating over the holidays. Ha! Fennel is so refreshing! Excellent combination! Thanks Sarah! The fennel gives this a great, subtle licorice flavor that I love. Happy New Year friend! *cough* I ate a BLT with french fries last night *cough* What? Did I just say that? Whoops! Try and not tell anybody. Diet starts Monday, right Karen? Haha! This is SO what I need right now! Jealous that you got a juicer. I have been debating it for awhile, but for now I make green smoothies in my blender. 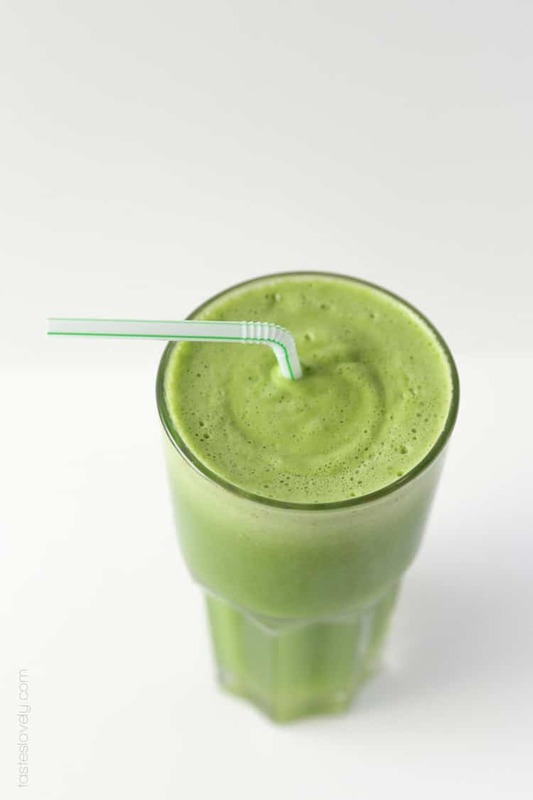 I am posting my favorite green smoothie next week, but I can’t wait to try making yours using my blender! Thanks Rachel! I love my juicer. Was definitely a splurge, but I use it all the time. My sister did a 3 day juice cleanse from Nekter Juice Bar that was almost as much as the cost of the juicer. Helped justify it : ) Can’t wait to see your green smoothie recipe next week too! What a beautiful green color! I’m usually intimidated by all these green smoothies, but this one looks so delicious. I’m definitely going to have to try this one. I just for a juicer for Christmas and I have been juicing everything under the sun, and having a blast trying a ton of different fruit/veggie blends. Can’t wait to try this one….sounds delish! What a great Christmas present! Isn’t juicing the best? Be careful when adding ginger, that stuff is pow.er.ful! Made that mistake when I was first juicing. Whoops. Hope you enjoy it! 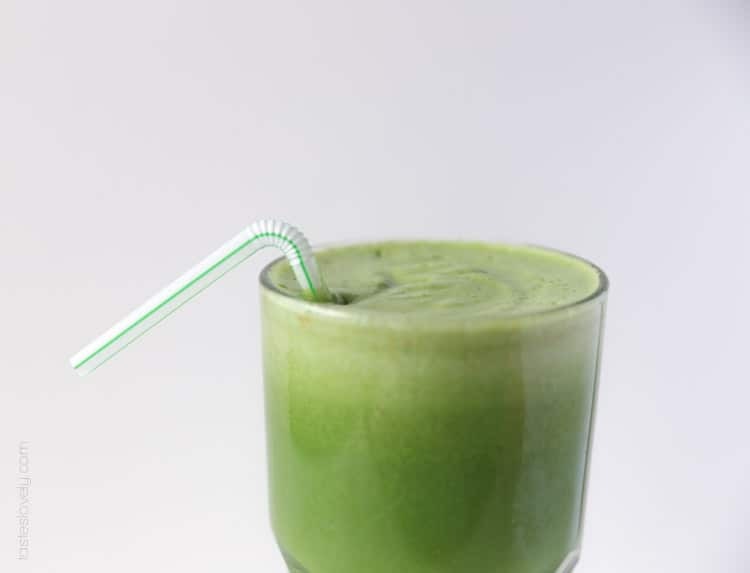 Spinach and apple is one of my favorite juices to make, especially with Granny Smith Apples! So tart and delicious! I love green smoothies, and this one has a beautiful combination ! Thanks! It’s one of my favorite combinations. Those all vegetable ones are tough to drink sometimes. I ate indulgently through the entire holiday season; in fact, I just finished off the last of the Christmas goodies that I’d stored in the freezer : \ I so need to drink this juice for about a week straight. Not only is this drink a lovely color, but I also love the flavors of apple and fennel! my myspace group? There’sa lot of people that I think would really enjoy your content. with us so I came to lok it over. I’m deinitely enjoying the information. 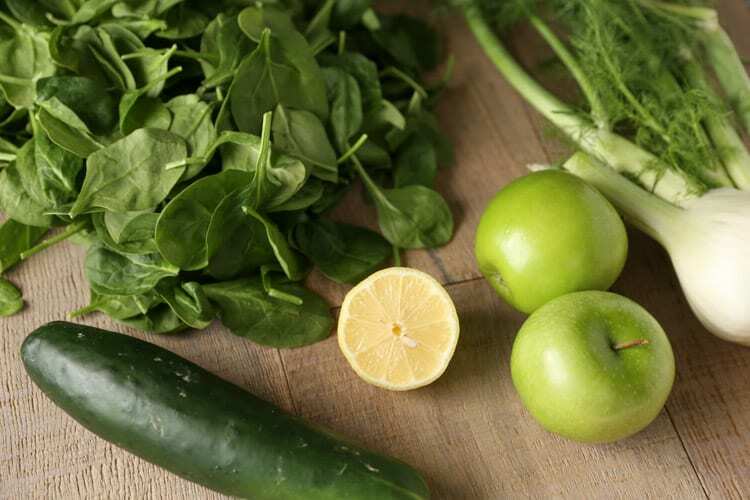 Thanks for finally writing about >Fennel & Apple Detox Green Juice — Tastes Lovely <Liked it! Mint and bulbing fennel are easy to grow too! All your swaps sound delicious! So glad you liked the juice! Perfect for summer time! Super iniovmatfre writing; keep it up.